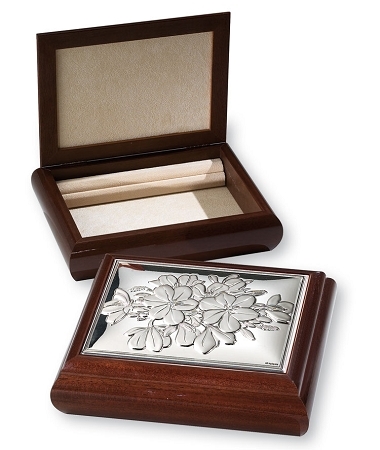 One-of-a-kind, elegant, jewelry box made with chestnut wood and with .925 hand-made sterling silver decoration. From one of the FINEST silversmiths in Europe comes this extraordinary work of art, a treasure for generations. Made from .925 Sterling Silver (not to mistake with silver plated) and walnut wood, this elegant jewelry box stands on its own merit. It takes days of hard precise work, crafting with pure precious materials to achieve this perfection. Gift it for that special someone you cherish.